Does Howard Silk fight the good fight during the second season of the Counterpart TV show on Starz? As we all know, the Nielsen ratings typically play a big role in determining whether a TV show like Counterpart is cancelled or renewed for season three. Unfortunately, most of us do not live in Nielsen households. Because many viewers feel frustration when their viewing habits and opinions aren’t considered, we invite you to rate all of the Counterpart season two episodes for us. **Status update below. A Starz sci-fi spy drama, Counterpart stars stars J.K. Simmons, Olivia Williams, Harry Lloyd, Nicholas Pinnock, Nazanin Boniadi, and Sara Serraiocco. Exploring themes including identity and fate, the thriller centers on a low-level bureaucrat, Howard Silk (Simmons), who toils away in relative obscurity at a United Nations spy outfit based in Berlin, Germany. After uncovering evidence that his agency is protecting a secret about traveling to a parallel dimension, Howard’s whole life changes. He soon plunges headlong into a strange world fraught with peril and treachery. James Cromwell guest stars in season two as Yanek. What do you think? Which season two episodes of the Counterpart TV series do you rate as wonderful, terrible, or somewhere between? Should Counterpart have been cancelled or renewed for season three? Don’t forget to vote, and share your thoughts, below. **2/11/2019 Status Update: Counterpart has been cancelled by Starz, but the producers are shopping it to other networks. Details here. More about: Counterpart, Counterpart: canceled or renewed? 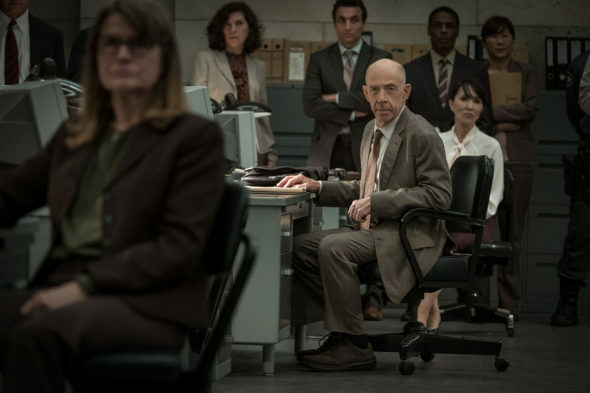 Counterpart: Is the Starz TV Show Cancelled or Renewed for Season Two? this is the best show ever, please bring back Howard Silk and the crew!!!!!!!!!!!!!PLEASE!!!!! Love love Counterpart!!! Please renew for third season. It is by far the best show on tv. Best show on TV. Every episode is amazing. Williams, Harry Lloyd actually the entire cast give It their all. Please renew for a Third Season plus many more. +1 for a third season, it’s one of best TV show currently! Best show on television, please renew! StarzCounterpart is an amazing show!!! The writing is excellent and the story very intriguing. The actors are all equally great! If the writing remains at this high level, consider another season (3) or two. This is what great TV is all about. Everyone that I’ve turned on to this show enjoy this as well and are now on board for the full ride. -If nothing else; a two hour movie to close the series and tie up all the great plot lines. best show ,looking forward for season 3!